It slipped into my consciousness the way memes do today, via Facebook and Twitter and a hashtag. In fact, Facebook has validated this memorialization with its own explanatory post, complete with a “Share” button. But “who says” that today is National Book Lovers Day? After all, June as Dairy Month is 79 years old and lives on courtesy of the National Dairy Council (and your local dairy farmer). July as ice cream month was kicked off in 1984 via a Congressional resolution. October as breast cancer awareness is a global collaboration that dates to 1985. National Chocolate Day was created by the National Confectioners Association. Red Nose Day is the brainchild of a global charity and debuted in 2015. But “National Book Lovers Day”? Facebook calls it “unofficial”, an understatement. Neither of my local libraries say a word about today. I can find no organization, anywhere, behind this. I used Google to search a specific date range, starting 10 years ago. The first hit — and the only match that year — was for 2009, for the partial phrase “Book Lovers Day.” The blog: bookditionary.blogspot.com (which explains Google’s finding it, since Google bought Blogger). There were 10 hits in 2011. And “national” has entered the picture. Yet one — only one — provides a link or a source for their claim. It just “is”. Take my word for it! The Origin of Book Lovers Day: Our research did not find the creator, or the origin of this day. National Book Lovers Day went mainstream in 2012. This helps explain the virility. BI is a big megaphone. Although the link is tenuous, most “national this” or “day that” have a clear commercial connection, even if that link is non-profit fundraising. 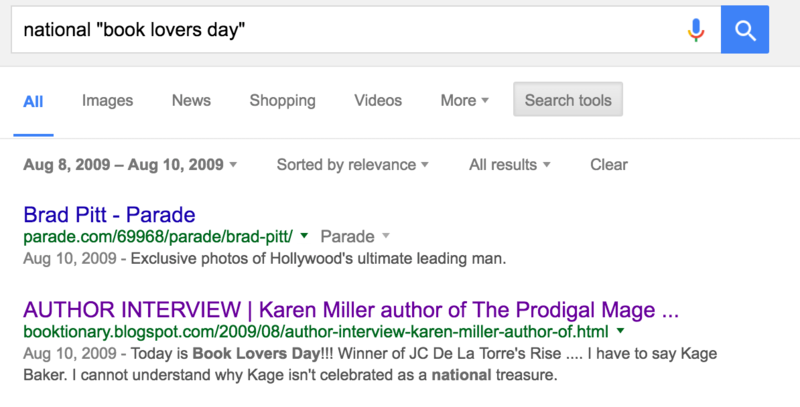 Also in 2012: Google served up images in search results for the first time. The memorial day with no origin has now been legitimized by the Clinton campaign, libraries hither and yon, Oxford University Press, Parade magazine, and a raft of social media managers. National Book Lovers Day is an opportunity for bookophiles to let people know that they are bookophiles, regardless of their “nation”! Or perhaps it’s an antidote to anti-intellectualism or anti-knowledge. In any case, please read a book or two or three. And not just today, but every day!